I am going through abit of a phase at the moment. I just can't get enough of my Owl Builder Punch. 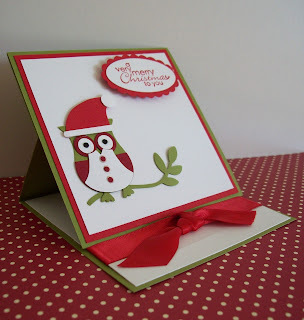 So this month I made a easel card using my Owl Builder Punch. Accessories: Owl Builder Punch, Bird Builder Punch, Oval Punch, Scallop Oval Punch, Real Red Satin Ribbon, Stampin Dimensionals and Adhesive.